Earn 7.5 SB per $ when you buy Gap gift cards at MyGiftCardsPlus, powered by Swagbucks. Gap has everything you need to express your personal style. Whether you're looking for wardrobe essentials such as t-shirts, hoodies, great-fitting pants, or denim, you'll find great clothes and accessories for men, women, boys, girls and baby at Gap. 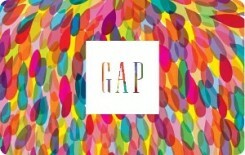 For the nearest store, call 1-800-GAP-STYLE, or shop our always-open gap.com store. Your gift code will be emailed posted on your account profile, under "My Gift Cards" within 10 business days of verifying your purchase.